Wed., July 4, 2018, 4:11 p.m.
MOSCOW – FIFA’s patience with Diego Maradona’s World Cup antics finally ran out on Wednesday. Soccer’s world body said it “strongly rebukes” comments by the Argentina great criticizing American referee Mark Geiger’s handling of England’s win against Colombia in the World Cup round of 16. It was yet another controversial moment involving Maradona –an official FIFA ambassador and figurehead of its “Legends” program celebrating former players – at a World Cup he has mostly attended as a VIP guest of FIFA. Maradona had been photographed before the game wearing a yellow Colombia jersey. England advanced to the quarterfinals in a penalty shootout after a 1-1 draw in a feisty game slowed by stoppages and players arguing with Geiger, a former high school teacher from New Jersey. “FIFA is extremely sorry to read such declarations from a player who has written the history of our game,” it said in a statement. FIFA had tolerated previous incidents by Maradona at games in Russia, which the 1986 World Cup winning captain was left to explain on his Facebook page. He apologized for making an offensive gesture toward a South Korean fan at Argentina’s opening 1-1 draw with Iceland in Moscow. He then suggested media were trying to make headlines from an innocent incident and also broke World Cup stadium rules by smoking a cigar. 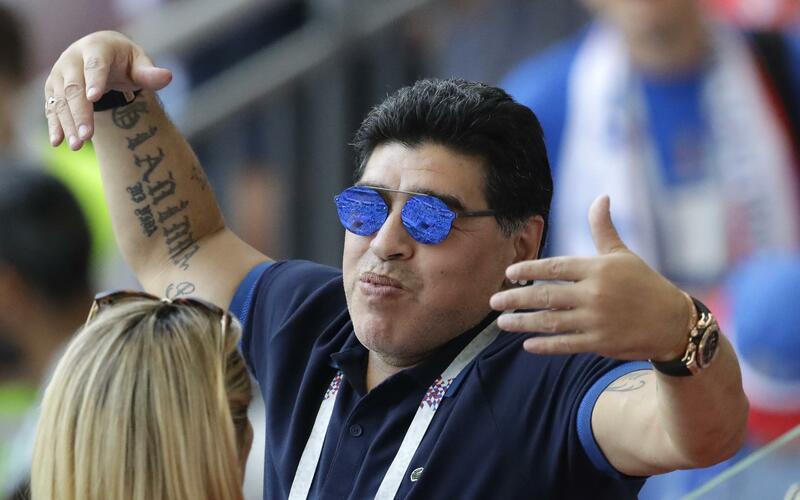 Maradona was filmed on FIFA’s official television broadcast aggressively raising his middle fingers after Argentina scored a late winning goal against Nigeria in St. Petersburg. He was also seen on footage circulated on social media seeming to be unwell and assisted from his seat into a private dining area. FIFA has had a turbulent relationship with Maradona in his career as a player and coach. He tested positive for a cocktail of banned substances at the 1994 World Cup in the United States and was sent home from the tournament. As Argentina’s coach in 2009, a FIFA suspension for a tirade aimed at reporters after a World Cup qualifying game barred Maradona from attending the 2010 finals draw in Cape Town, South Africa. Maradona was an outspoken critic of previous FIFA president Sepp Blatter, but was brought back into the fold when Gianni Infantino was elected in 2016. He came to the Kremlin in Moscow last December wearing a gold bow tie to take part in the 2018 draw. Published: July 4, 2018, 4:11 p.m.